Advancing Time: Trump Monkey Hammers Powell Into Slowing Rate Hikes! 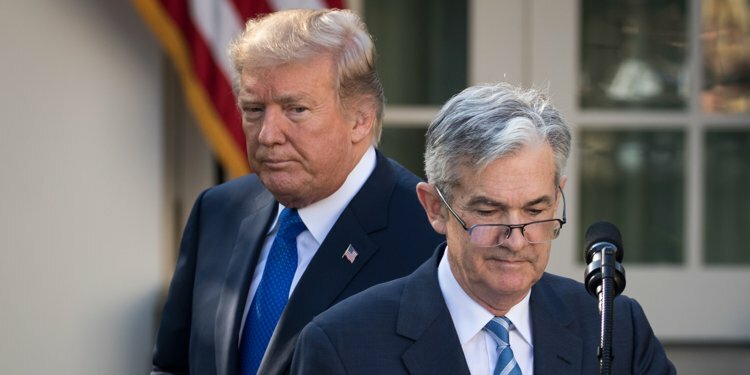 Trump Monkey Hammers Powell Into Slowing Rate Hikes! policymakers need to prepare. The U.S. is not an island. While the message, "The U.S. is not an island" conflicts with putting America first the WSJ piece is in reaction to President Trump proclaiming the Fed "is making a big mistake with ridiculous rate-hikes," but the problem may not be the Fed as much as Trump tethering himself too closely to the stock market as an indicator of his success. Because of his polarizing political style and claims of economic acumen, Trump more than most Presidents will most likely be judged a success or failure based on his administration's economic results. From Trump's point of view, there's no good reason why the central bank should not wait another 2-6 years before taking away the punch bowl. The editorial went on to warn how higher rates will put other countries under stress but left unanswered what many of those suffering from a decade of low interest rates on their saving see as the 64 million dollar question, which is, if not now when? The idea that now is not the time to hike rates is of course very popular and solidly endorsed by those who have benefited by feeding at the trough of easy money. The fact is easy money is not a panacea to prosperity and brings with it a slew of bad side-effects such as transferring wealth from savers and forcing them to take on more risk simply to obtain a reasonable return on their money. Years ago before the "Bernanke has all the answers" era, many of us criticized Japan for failing to own up to its problems. Many people thought Japan should address the mess it had created and do the right thing, broadly accepted was the concept that only by letting its zombie banks and industries fail could Japan clean out the system and move forward. Instead, the Government of Japan ran huge deficits and ran up massive debt. By putting many companies on life support the country languished. For decades Japan avoided disaster only because it enjoyed a large trade surplus, today that trade surplus has vanished but the massive debt remains. While they claim otherwise, in many ways the Fed has put America and the world on a path that mirrors the same fruitless road taken by Japan. This path has avoided real reform and bails out the very people that caused many of our problems. Bernanke upped the ante by keeping alive those that were failing and setting on high the bailout and money printing machines. He flooded America and the world with QE by selling other central bankers on this solution and taking the lead in an experiment that is losing traction. Looking back it is now clear that real momentum seems to ebb shortly after each new wave of stimulus and another fix seems to constantly be needed. Two key differences exist when we view America and Japan, first America does not enjoy a huge trade surplus to offset our deficit spending. This means we are putting ourselves deeper and deeper into the hole and our debt has ballooned. For years Japan offset the government deficit with money coming in from foreign trade. The other very important difference is the American dollar is the worlds reserve currency. Changes in the value of the dollar are thus magnified in importance and do not just affect America but the whole world. All the people and countries that hold dollars are affected and can at any time greatly alter our ability to do business as usual. In the future, as we look back and measure the results of Bernanke's policies it seems they may not be much different than those achieved by Japan over the last few decades. In many ways, our course is very similar to the one that Japan embarked on and is now being blamed and labeled as the reason Japan remains mired in slow growth and deflation. Bernanke has endorsed and encouraged Japan to step on the gas and print more money until they lower the value of the yen and force inflation to set them on a path forward. This is akin to a doctor telling a patient to double or triple his dosage when the medicine does not work. The policymakers in Japan should be careful what they wish for as they may find they have stepped onto a very slippery slope. Recent statements by Chairman Powell were interpreted as his moving to a more dovish stance on Wednesday and this sent markets soaring with the Dow Jones Industrial Average surging more than 600 points. Investors took his words to suggest the Fed might slow the future pace of interest rate hikes when he said rates are now just slightly below what he considers a "neutral" level. Whether it was to appease the President or because weakness is working its way into the economy this will certainly shift more pressure and responsibility on Trump should things turn south.